Peanuts should have a more prominent place on the American table. Former president Jimmy Carter’s family roots as “peanut farmers” suggested modest, humble, hard working values and not the southern glamour of Tara. During George Washington Carver’s Administration in the 1930’s a program was initiated to encourage farmers to increase peanut production, and recipes were developed to support this program. In Colonial America the peanut had mostly been used as a garden crop or for animal feed. In spite of this promotion peanuts are rarely used in savory dishes and stews as in South America, Africa and Indonesia. I’m not sure why peanuts are now just starting to show up in the farmer’s market’s here in the Northeast but I’m up for the challenge of developing some vegetarian dishes based on this legume. I’m a committed carnivore who is just as committed to my non-meat days 2 to 3 times a week. 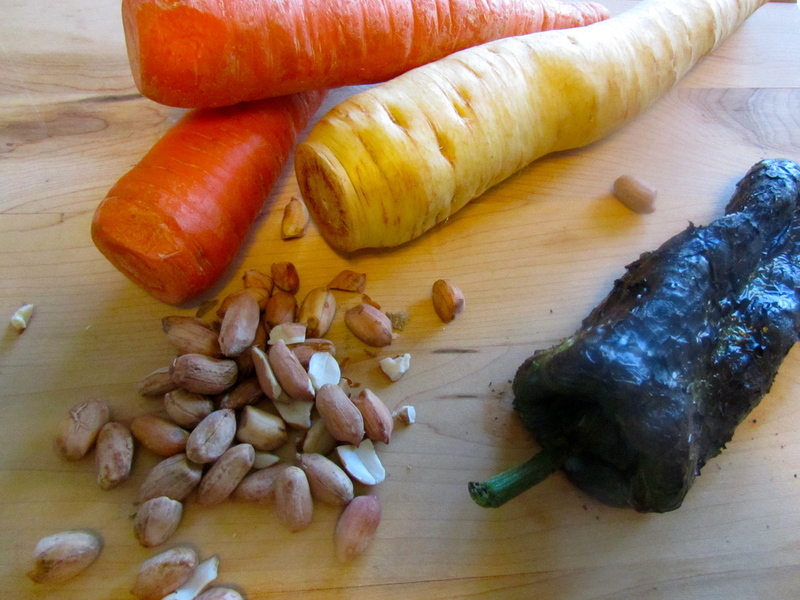 Here is a vegetarian stew I made after picking up “local” peanuts at my farmers market. It is best to shell them and toast them briefly in a hot pan or on a baking sheet in the oven to bring out flavor beforehand. 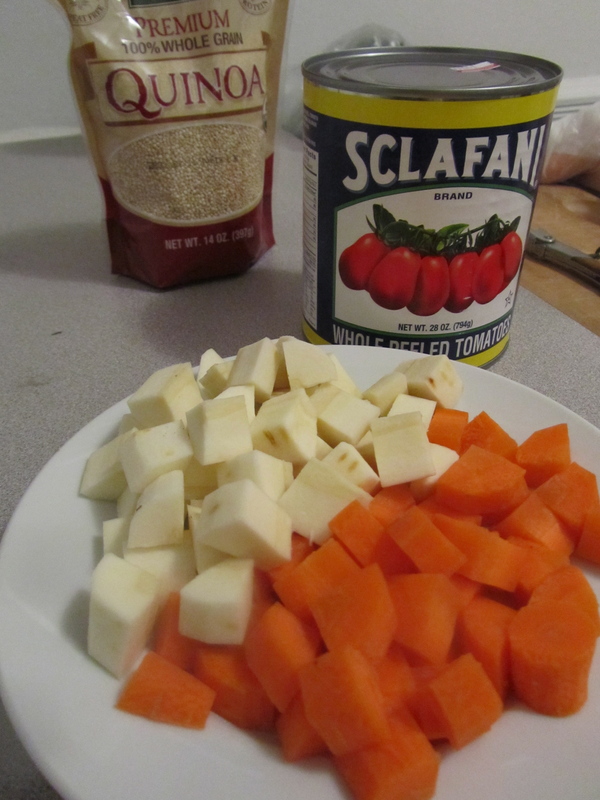 I like my stews chunky and cutting the veggies in ½ inch cubes gives them time to cook and achieve a carmalized surface. Roast the Poblano chilis over the gas flame on your stove or blister them under the broiler and place in a plastic bag. Cut the carrots and parsnips into ½ inch cubes, cut the onion into large dice. Saute the onions in 2 T. grapeseed oil until transparent. Add the parsnips, carrots and garlic, sauté on medium high heat until they start to brown, salt and pepper. Add the whole peanuts and a teas of dried oregano. In a blender puree the tomatoes with the peanut butter and add to the stew. Cook down for about 10 minutes and then add the vegetable broth, cook uncovered for 30 minutes. Peel the poblano peppers and cut into ½ inch cubes. Chop parsley and set aside. Add the poblanos to the stew for the last 10 minutes. 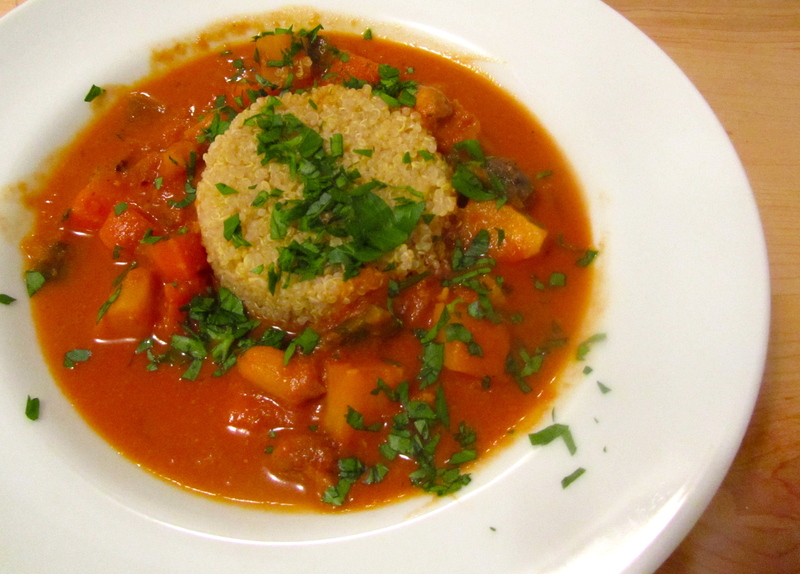 Cook Quinoa and place ½ cup in the center of a bowl and spoon the stew around the quinoa. Garnish with chopped parsley.